Santa’s got the right idea today. 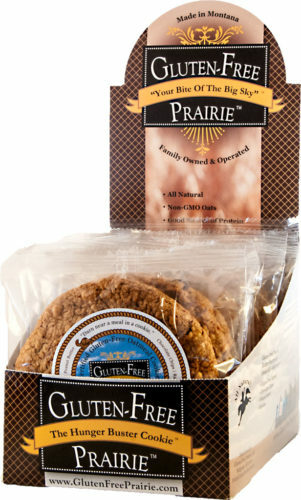 He stopped by the Gluten-Free Prairie Bakery and filled his bag with Hunger Buster Cookies. 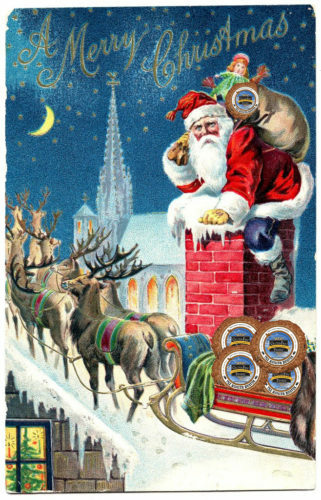 Every year Santa wonders what he can give to all of the helpers who make his life easier – the UPS and Fed Ex guys who deliver all the toy parts to the North Pole, the mailman who delivers the millions of letters from the kids all over the world, the dry cleaner who keeps Santa looking fresh, the Elves who do all the work, and of course the guy who cleans ups after the reindeer. Santa can’t do it alone, and neither can we. Wondering what to give those special helpers in your life? Our Hunger Buster Cookies are available by the dozen on Amazon – Free Shipping with Prime Membership. Each 3 ounce Cookie is packed with and 10 gms of protein, our Gluten-Free Prairie Certified Gluten-Free Oats, peanut butter, chocolate chips, raisins . All Natural. No preservatives, no additives or fillers of any kind. Hunger Busters are great stocking stuffers too. No matter what your standing is on Santa’s Naughty or Nice list – there is no doubt that the gardener, pool man, dog groomer, hairdresser and countless others, will love being on the receiving end of this yummy treat. Fuel Your Gluten-Free Holiday Shopping. Chocolate Oatmeal Saves the Day!